The Warrior Strength Muay Thai program is perfect for those who are looking to improve their fitness, learn self-defense techniques, or even fight in Muay Thai or MMA. Our program isn’t your typical Muay Thai Kickboxing program. What we offer is authentic Thai boxing, under the lineage of Ajahn Suchart. Have an amazing workout while developing speed, strength, confidence and self-defense skills. If you’re brand new and have no experience, that’s perfect because you’ll be able to train like a fighter and get into fighting shape, in an environment cultivated for all skill levels – the curriculum is catered for beginners all the way to fighters. 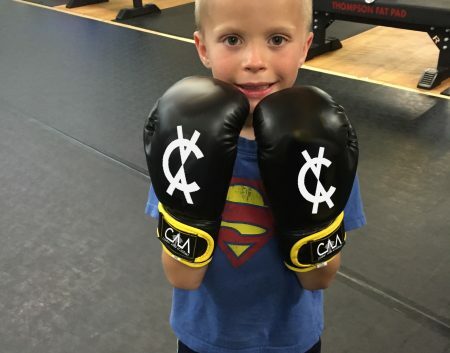 We provide a fun, clean, and safe environment that introduces students to the principles, theories, and techniques of Muay Thai, for all ages and all skill levels. Regardless of your goal, you’ll be surrounded by like-minded individuals enjoying the physical and mental challenge of that the art of Muay Thai provides. Our Youth Muay Thai program focuses on the same techniques and skills we teach in our adult program. Students learn beginning to advanced Muay Thai Kickboxing skills that help them develop confidence, strength, and teamwork. We don’t just focus on the techniques; our kids classes also focus on life skills to be amazing human beings!